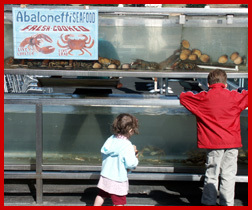 The two kids stood raptly before the very large fish tank. Eyes wide, fingers pointing, they watched the exotic sea creatures swim. Lobsters. I, standing twenty yards away on Monterey’s Fisherman’s Wharf, was watching a vision of myself some 45 years earlier. I’m not big on nostalgia; but traveling to Monterey, California, had been a significant childhood’s journey. I came here in 1958. I was nine. My mother’s "baby" sister - my aunt Cleo - had moved with her family to Monterey when my uncle Mitch (not a namesake) was doing an army stint at Ford Ord. My mother’s colleague Vivian, a fellow New York City high school teacher, drove us cross-country so we could visit them, a trip that took five non-stop days in those pre-interstate highway days. Years later, wife Penny and our two kids, then aged perhaps eight and ten, made a quick visit to the then new Monterey Aquarium. In between, I became a voracious John Steinbeck reader, encouraged no doubt by applying a child’s imagination that could see Steinbeck’s characters still populating - and the sardines still stinkin up - derelict Cannery Row. What did I remember? How had things changed? Monterey’s Fisherman’s Wharf, just a city block in length, balances precariously between cool funky-ness and tourist trappy-ness. Shops and seafood restaurants line the walkway in brightly painted wooden buildings perched on heavy pier logs sunk into the water. Some sell trinkets, assorted t-shirts and other cheap souvenirs. Some sell fresh fish. You can board a whale watching boat, depart for deep sea fishing or glass-bottom boat touring here, or dine on fine seafood. Or stare, google-eyed, at the live lobsters in a tank. The pier, like a small sunny patch, shines with color and activity that excites kids. Just the way I remembered it. Cannery Row, however, has come a long way baby. It’s enthralling, no doubt. But, to one who holds imagination- and novelistic-fired memories it’s grown far too commercial. Yes, the fictional and real-life ghosts still inhabit the place. It’s just not a ghost town they inhabit. Still, even for a lover of rotting architectural relics, Cannery Row is a family and shoppers must-see. The canneries loom over the narrow street as they ever did, wearing now gleaming coats of fresh paint and holding not smelly fish by the boatload, but retail emporia. Here, you can find more trinket shops, plus ice cream parlors and candy stores, and fast and street food outlets aplenty. But, they’re interspersed with the fashionable and trendy, the up-cultural and haute. 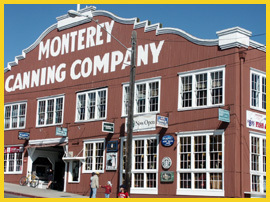 The variety runs from the Taste of Monterey Wine Visitors Center and the Culinary Center of Monterey through 100 shops, two dozen-plus restaurants and two-score art galleries. And not a sardine in sight. A tidily quaint trolley runs along the avenue; a bike path parallels the street. You can rent bikes of all kinds on which to tour the area. Or, rent a kayak and put out to sea. A short ride just north of Cannery Row and Fisherman’s Wharf takes you to the Dennis-the-Menace Playground. The facility, Dennis’ creator, local Hank Ketchum, is a true child-pleaser. So. Here are shopping, eating, cycling, elaborate playgrounds and more, all with the bay spreading picturesquely beside. And it’s that ocean that sparks Cannery Row’s kid-friendly highlight. The aquarium. While large aquaria have become common in major cities, this was among the country’s first, conceived in 1977. By 1984 they’d gotten the old Hovden Cannery converted, and it opened with an inaugural parade, fireworks and a boat procession. From the outside, the place still resembles a cannery. But those smokestacks are fiberglass replicas. Inside, except for the exhibit near the entryway depicting the building’s history, the latticework steel, huge windows, wide ramps and staircases, bright paint and state-of-the-art displays leave little resemblance to a cannery. More important than a connection to it commercial past, however, is the facility’s thematic connection to its environment. "Monterey Bay ranks among the world’s most diverse and spectacular marine regions," says a passage from the aquarium press kit. "The bay is at the heart of the largest protected marine area in the mainland United States. 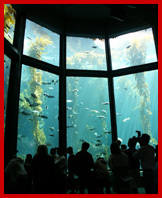 The aquarium’s permanent exhibits and galleries highlight the colorful and complex array of marine life found on California’s central coast, from coastal wetlands to the open ocean and deep sea. Special exhibitions feature marine life from around the world." Indeed, to step into the building is, in many ways, to take a dive into the adjacent waters. And, like the ocean itself, there’s so much to see and do. Kids, of course, immediately gravitate to touch pools and sharks. I followed a crew of tykes into the "Rock and Reef Homes Splash Zone." Yep, straight to the touch pool they went. Kids jus gotta know what those slimy-looking, odd-shaped creatures feel like. The otters are fed and perform live "shows" three times daily. But, if your timing’s off, there’s no need to fret. Otters naturally create marvelous entertainment. I tore myself away, and wandered until I came upon something truly amazing. An exhibit called "Jellies: Living Art." Whoa! I mean, who ever thought of jellyfish as works of art? 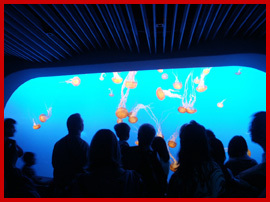 The exhibit includes jellies never exhibited in North America, innovative artwork and a walk-through jelly swarm. Very cool. But, you’re undoubtedly asking, what about those sharks? Not to worry. They’re there. But, with a whole ‘nother twist. Instead of just some huge whites swimming around, here you see how sharks have been regarded in various cultures around the world, the dangers they face, and what’s being done to preserve the species. When my kids were young, we traveled northbound on Highway 1 from grandma’s in southern California to cousin Burlie’s house in Oakland. When I veered over the oncoming traffic lane to stop and photograph the view from a cliff’s edge, the kids screamed I was going to kill us all. To this day, they swear we were headed over the edge. No, we were never in danger. And, the photos are worth the abuse I’ve absorbed. These coastal panoramas are striking enough to justify breaking the cardinal rule of auto travel with children that says "don’t expect them to ride quietly and admire the scenery." Here were have an exception. And the winding road adds to the excitement. On this visit, my colleagues and I stopped at Point Lobos State Reserve. We chose an easy hike along a path atop a cliff high above a small inlet called China Cove. Harbor seals and sea otters frolicked a hundred feet below us by tiny Gibson Beach. 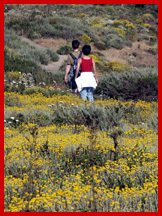 The path opened into a cliff-top field ablaze with yellow flowers. In the distance, Bird Rock was blanketed with cormorants. We immersed ourselves in more views over lunch at the cliffside Nepenthe Restaurant. The food was great. But, hey, even if you only sip a soda, it’s a cool place to stop and gaze with awe. Returning to Monterey, we stumbled upon a place where cars filled a small dirt parking lot and spilled along the roadside. "What’s this?" someone called out. 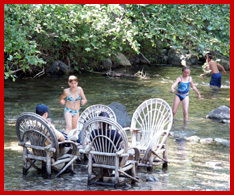 It was the Big Sur River Inn, a 20-room B&B with a full-service restaurant that sits beside the Big Sur River. Out back, it looked like block party: kids played tag on the lawn and splashed in the pool; folks relaxed on beach chairs anchored in the river; dogs sniffed along the riverbanks; a jazz quartet played; folks on a deck sipped drinks beneath beach umbrellas; families lazed on blankets on the lawn. No reason to hurry on. We ordered beers and settled into the music. Evan Oakes brought his 14-passenger van to an abrupt stop. As far as the eye could see, we saw crops. Lettuce. Cabbage. Huge tracts of broccoli. Strawberries, too, along with spinach cauliflower and celery. Not to mention flowers. "The Salinas Valley," he said, "is known as the ‘salad bowl of the world.’" Some 435 varieties of vegetables and fruit are grown here, plus wine grapes - and those ornamental flowers. Evan, an agricultural scientist, operates a small tour company, Ag Venture Tours. He drives people through the fields in his van. Doesn’t sound exciting? Not really kid-enticing? Try riding the fields with Evan. The guy’s enthusiasm, combined with an encyclopedic knowledge of California’s farming industry (right down to the statistics of how much of what is grown where), is infectious. Indeed, Oakes offers two different tours designed specifically for kids. We stopped roadside to examine all kinds of plants. The artichokes were the most fascinating for me. Within a few hundred yards you could see the plant’s progression as they grew towards maturity. Evan’s in-depth explanation of the picking/processing/packing/ shipping operations - especially the scale at which they’re done - fascinated me. And, the sight of eighteen-wheeler refrigerator trucks lining up to load will fascinate most any small boy. Who knows, by the time your child has seen the valley through Evan’s eyes, s/he may suddenly want to eat her/his vegetables. Heck, I even ate artichokes at dinner that night. I hate artichokes. So, had greater Monterey changed? Yes. Back in the day, my Uncle Mitch gave me a screwdriver and took me abalone fishing; that is rightfully restricted now. He took me to see the tanks at Ford Ord; that’s de-commissioned now and part of the University of California. But, every place has changed, hasn’t it? And, Monterey hadn’t changed so much that I didn’t recognize it. Let’s just hope it’s not 40 more years til I get back again. More on Destination Monterey here. Asilomar: originally a YWCA camp and conference center opened in 1913, this large resort is situated in Pacific Grove along the ocean, and hosts many family reunions and various kinds of retreats; fascinating Arts & Crafts-style architecture; great location; may be a bit rustic or "summer-campy" for some; family-style breakfasts included; reasonably priced; www.visitasilomar.com.